Synopsis: A small-town doctor learns that the population of his community is being replaced by emotionless alien duplicates. 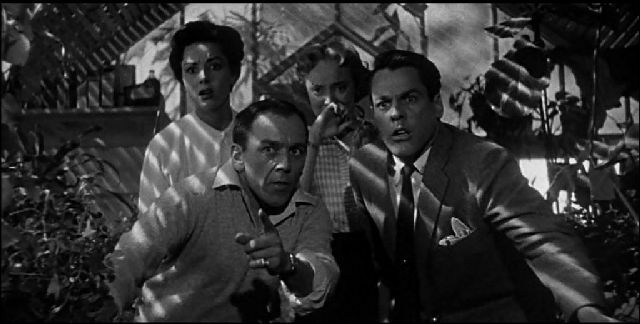 Whether viewed as a political allegory or simply as a straightforward alien invasion flick, Don Siegel’s Invasion of the Body Snatchers rates as one of — if not the — best SF movies of the 1950s. Told with a refreshing briskness of pace that’s reflected in its relatively short (80 minute) running time, the film establishes a realistic all-American small-town milieu which it then proceeds to pull apart with its unsettling tale of alien spores stealthily assuming the identities of Santa Mira’s townsfolk. Siegel’s original vision was much bleaker than the version that exists today, with Miles Bennell (Kevin McCarthy) issuing frantic but unheeded warnings to impatient and uncaring drivers on a busy highway before exhorting direct to camera that ‘You’re next! YOU’RE NEXT!’ providing a downbeat ending from which no hope could possibly be gleaned. Allied Artists were unhappy with this ending, however, and insisted on the hospital scenes which now frame the main story and offer at least some small ray of hope for humanity. Dr. Hill (Whit Bissell) is summoned to a hospital psychiatric ward late one night because of the highly agitated and apparently delusional state of a new patient who was arrested as he tried to flag down drivers on a highway. The patient is Miles Bennell (Kevin McCarthy), a doctor from the nearby California town of Santa Mira, and he proceeds to tell Hill a fantastic story. A week earlier, while attending a medical convention, Bennell was called back to his practice by his nurse, Sally Withers (Jean Willes) because of a sudden surge in patients, but when he returns Bennell finds that most of his appointments have been cancelled because the patients claimed they no longer required his services. All is not lost, however, because former girlfriend Becky Driscoll (Dana Wynter), who has just returned to their hometown after a Reno divorce, drops by to say hello, instantly rekindling Bennell’s interest. Becky’s visit isn’t entirely personal however: she asks Bennell to look in on her cousin, Wilma (Virginia Christine) who, for some reason, has been insisting that her father, Ira (Tom Fadden) isn’t her real father, but an impostor, even though he looks and acts the same, and has all her father’s memories. Coincidentally, that same day little Jimmy Grimaldi (Bobby Clark), whom Bennell nearly ran over when he ran across the road to escape his parents, is brought into the surgery by his Grandmother. Jimmy insists that his mother isn’t his real mother, and Bennell is forced to administer a sedative to calm the boy down. Bennell’s concerns are assuaged a little after he pays a visit on Wilma and Ira. He finds the old man to be his usual self, and Wilma reluctantly agrees to see a psychiatrist. That night, however, while out on a date with Becky, he receives an urgent call to attend the house of Jack (King Donovan) and Teddy Belicec (Carolyn Jones). Initially a little put out when he discovers there’s nothing wrong with the couple, Bennell is alarmed when they show him a body on their billiard table. But this is no ordinary body, its features are only partially formed and it has no fingerprints. Despite this, it bears a worrying resemblance to Jack Belicec. Bennell instructs the couple to keep an eye on the body until the morning, and to call him if anything happens, then takes Becky home, where they meet her father (Kenneth Patterson) emerging from the basement. Later that night, after receiving a call from the Belicec’s in which they tell him that the body on the billiard table has developed a cut on the palm of his hand which the real Jack suffered only hours before, Bennell returns to Becky’s house on a hunch and breaks into her father’s basement. Inside, he finds a pod containing a half-developed replica of Becky. After spiriting Becky away while her father sleeps, the couple, together with the Belicecs spend the night at Bennell’s place. They notify psychiatrist Dan Kauffman (Larry Gates) about the pods, but when they try to show him the evidence they find both bodies have disappeared. Kauffman shoots holes in Bennell’s story, explaining with irritating logic that his mind was spooked by the mass hysteria sweeping through the town and that he only thought he saw Becky’s half-formed body, while Police Chief Grivett (Ralph Dumke) informs them that a body matching the description of the one on the Belicec’s billiard table has been discovered burning on a haystack outside of town. Bennell is temporarily persuaded, but later that day is perturbed by the strange calmness now displayed by both Wilma and young Jimmy Grimaldi. Then, at a barbeque given by the Belicec’s that night, he finds four enormous pods in their greenhouse, each containing a partially formed likeness of one of them, and the terrified couples realise that these likenesses are taking over the real people’s bodies and minds while they sleep. Invasion of the Body Snatchers was released at a time when America was in the grip of anti-Communist hysteria propagated by Senator Joseph McCarthy and the HUAC. The senator’s campaign cynically played on America’s self-image as a newly prosperous haven of family values and decency, and the fragility of this idyllic lifestyle in the face of hostile outside forces and the country’s own unwatchfulness. Whether the movie was deliberately intended as an allegory of the danger posed by the Communist threat to an unheeding community is open to debate: director Don Siegel maintained it was, while screenwriter Daniel Mainwaring insisted that it wasn’t. Either way, like any movie, Invasion of the Body Snatchers means whatever you perceive it to mean, and there’s no denying that the plot elements fit perfectly with the allegorical theory. Part of me likes to think it was, simply because it would make the movie even cleverer than it already is. The growing sense of paranoia is superbly realised — the outside world, so ostensibly normal, becomes an increasingly frightening and dangerous place — culminating in a thirty minute chase which is incredibly suspenseful. Paradoxically, our preconceived notions of safety and security become subverted; light becomes an enemy to Bennell and Becky while darkness becomes their ally — note how often they are travelling toward a bright light as they approach danger. Perhaps the only flaw that really detracts from the overall quality of Invasion of the Body Snatchers is that clumsy framing device tacked on by the studio against Don Siegel’s wishes. Imagine just how much more powerful the movie would be if it were to end on that hysterical moment when Bennell bellows at the camera, all composure lost, all hope gone. It’s perhaps no surprise, given the era in which the movie was made, that Allied Artists insisted on those changes, but it’s about time someone saw fit to realise the shorter version that Siegel originally intended audiences to see.